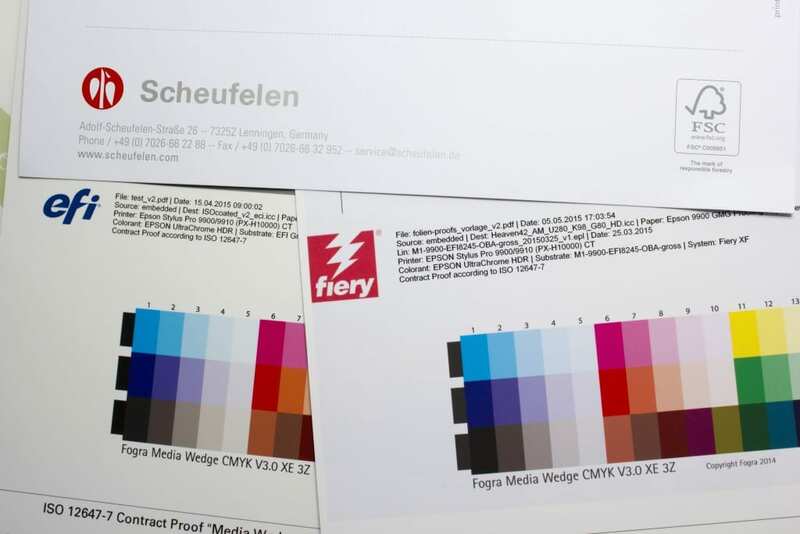 The Proof GmbH provides proofs for Scheufelen Heaven 42 papers on the new EFI 8245 OBA proofing paper. With this new proofing paper it is now possible to proof the bright-white paper dye of Heaven42l. 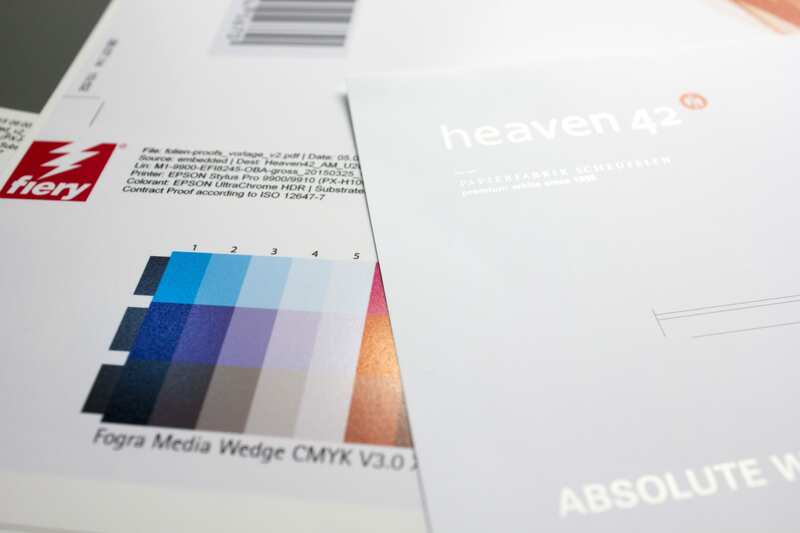 With Heaven 42 a bright white paper was developed by the German paper company Scheufelen, which opened up a new color whiteness. Especially technical motifs (shades of gray, silver tones from 4c, strong contrasts) act on Heaven 42 particularly brilliant and neutral. With an unchanged separation (eg with ICC profile “ISOcoated_v2”), but the printed image with the same color and dot gain looks considerably colder. Using images with warm tones (z. B. skintones) it is therefore recommended to do color adjustments. 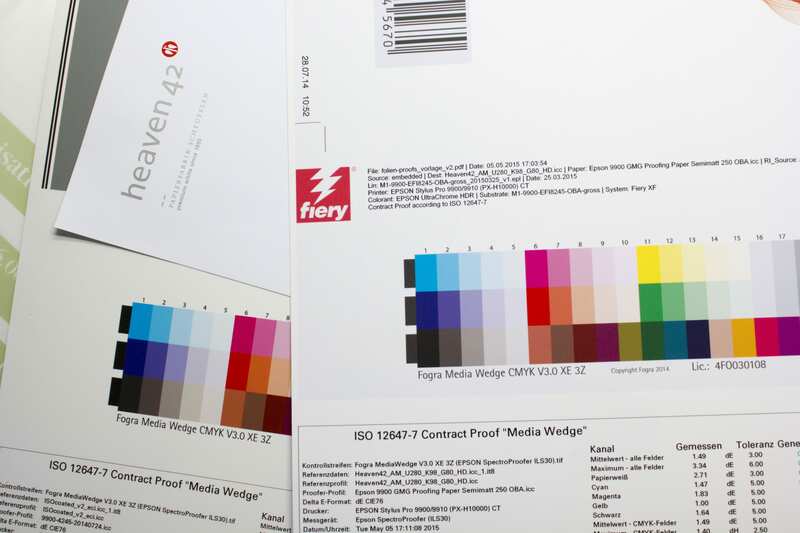 We proofed Heaven42 on EFI Proof Paper 8245 OBA with optical brighteners and measure the Proofs M1 standard with consideration of optical brighteners. The proof can be provided with a UGRA / FOGRA media wedge and test report. Our Heaven42 proofs provide a good simulation of Heaven42 offered by Scheufelen for the ICC Profiles of Heidelberger Druck. The profile can be downloaded from the Scheufelen Website with additional notes from Scheufelen to pressure requirements etc., which are also included in the download of the profile. The Heaven 42 Profiles can be downloaded here. Scheufelen offers two ICC-Profiles for Download, we are proofing the profile of Heidelberger Druck (“_HD”). Heaven 42 Proofs can be ordered directly in Proof store of Proof.de. Simply select the profile “Heaven 42 (Coated OBA)”. Our telephone support often asks for a proof on publication paper. Unfortunately, we always have to answer the question negatively. I would like to briefly explain the reasons for this in the following article. Proofing on publication paper is still technically impossible. 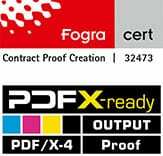 All proofing systems currently certified by Fogra are based on an inkjet printer as a test printer, mostly from Epson, Canon or HP. These printers are characterised by a large colour space, good resolution and excellent homogeneity and colour stability – all characteristics that are absolutely necessary for a proof printing system. The Epson systems used by the majority of proof printers are based on 11-colour pigment inks, which can reproduce a significantly larger colour space than e.g. ISOCoatedV2. However, the prerequisite for this is the use of special papers optimized for inkjet printing, in which the pigments and inks are optimally emphasized. This requires special coatings that are optimized for optimum reproduction, fast drying, good abrasion resistance and high UV stability of the print. On an image printing paper without these coatings, the ink would run, hardly dry and would not be smudge-proof. The color space would also be impossible to achieve. A proof would therefore not be possible from this point of view. Stamp once on a coated printing paper. You can easily wipe off the stamping ink even after many days. The situation is similar with inkjet inks. And even colour laser printers are no solution. The toner applied to the paper in these systems and then liquefied by heat to bond with the paper cannot penetrate the closed coated surfaces. This means that the print is not fused and the toner can be wiped off the surface directly after printing. Modern digital printing systems such as the iGen from Xerox are also capable of neatly mapping color spaces such as ISOCoatedV2. Some of these systems are also able to print offset papers properly, although here too special papers optimized for digital printing are used. However, despite major improvements in recent years, these digital printing systems are still not capable of reproducing the small color deviations required for a true color-accurate proof, a “contract proof in accordance with ISO 12647-7”. Even after a complete recalibration and re-profiling on the paper used, these systems only achieve “Validation Print” quality according to ISO 12647-8. “Validation Prints” are not “contract proofs”, they are not color-binding and not legally binding, since the permissible color deviations of Validation Prints may be significantly higher than those of real proofs. The result would therefore only be a “print”, which is not binding for a print shop as a result, not “color-binding” but only “colored goods”. And it is precisely this commitment that must be achieved with a proof. In addition, the color stability of these systems is predominantly so critical that even with a new profiling in the morning in the afternoon, even the lax validation print tolerances can no longer be achieved and the system again has to be recalibrated and profiled. The only solution: the classic proof. If it wasn’t for the cost. Here, real offset printing with real colours produces the real print later in an edition of one piece. Since the proof is printed in real offset printing, production paper can also be used here without any problems. The downside? The price. Depending on the format, a proof on circulation paper costs several hundred euros. Since press proofs are still predominantly film-based printed today, but the real printing is usually via computer-to-plate printing plates, there is no 100% precision of the press proof for the production print today either. CTP is also available from proofing companies, but at an even higher cost. A little postcard, a slim fanfold? This is not economically viable in proof printing. So don’t use circulation paper for shorter print runs. Especially with ISOCoatedV2, a classic proof offers you true color accuracy and stability at very low costs. Just lay the cover paper next to it. We are sure that this is the best way for you to imagine what the subsequent printing will look like, in the “most colour-accurate” and also at the best price. And in comparison to Validation Print digital printing, it is legally binding and binding in colour. EAN codes are standard on every product today. While in the good old days, shopowners themselves typed the prices into a cash register by hand, today scanner cash registers are the rule, which scan standardized EAN codes with a laser and thus clearly recognize the article and add it to the receipt. EAN, by the way, stands for “European Article Number” and was replaced in 2009 by the global GTIN, “Global Trade Item Number”. The EAN or GTIN is a barcode that can be read automatically and read by barcode readers. For graphic designers in Europe, two standards from the almost infinite number of EAN codes in use worldwide are primarily important in the product area. EAN 13 and EAN 8, i.e. a barcode of either 13 or 8 digits. What do these numbers actually mean? Convenient Data Upload: Each item one or more files can now be uploaded. So you can assign your data directly to the individual proofs. Payment by Paypal, direct debit, invoice etc . : You are on shop.proof.de with Paypal and direct debit payment methods more available. Of course you can continue to conveniently order proofs on invoice. See Previous orders, invoices, data uploads: You can always check your previous orders, call the invoices to and check the files uploaded. The proof is much darker than the image on my monitor. Why? Only calibrated monitors can accurately display color. When I buy a cheap monitor and connect it to my computer, I definitely can’t see any real color. As a rule of thumb, only a hardware-calibrated monitor has a chance for correct color. A monitor below 1,000 Euro cannot usually be calibrated to good color representation for the standard color space ISOCoated V2, because it has a too small color gamut. Only real proof monitors are also designed and suitable for the display of proofable colors. Especially in winter the lighting conditions are often poor. And incandescent lamps, energy-saving lamps and conventional neon tubes only provide very poor colour reproduction. Without a D50 light source, a proof cannot be evaluated. Often the image editing software like Photoshop is simply installed and used without adjustments. The selected color profiles often do not correspond to the profiles used for proofing. Apple-Shift-K for Macintosh and Control-Shift-K for Windows show you your profile settings in Photoshop. In general, no patent remedy can be given for the correct display of proofs for the monitor. However, if a proof is provided with UGRA/Fogra media wedge CMYK V3.0 and test report, the chances are high that it reproduces the required colors very precisely. If your monitor image does not correspond to the proof, the error usually lies with you. The list of causes above can help you in troubleshooting. My customer wants to print on a tin can. Pantone? CMYK? Can this be simulated in the proof? Requests such as the proof of a printed tin can often reach us. Why can’t such a printed can be “proofed”? Metal is printed with a varnish. Neither the colour of the metal of the tin can nor the colour of the lacquer is clearly defined, nor the thickness of the lacquer application and the printing process in which the lacquer is applied (digital print / screen printing, pad printing etc.) is defined. A contract proof refers to very tight tolerances and precisely defined framework conditions. This includes not only the densitometric and colorimetric reference of the printing ink, but also, for example, the paper white, which is simulated very precisely in the proof. For exactly this reason there is no proof for recycled paper: The papers and paper whites are simply so different that no uniform, standardized “color” of a recycled paper can be defined. From classic recycled paper with a neutral grey or yellowish-grey colouring to de-inked, almost white recycled papers, everything is available on the market. Just not by default. Therefore, a proof always refers to offset or gravure printing under standardized conditions. Changed surfaces such as metal or changed paper colours such as recycled or high-quality image papers with inclusions or printing on coloured papers have not yet been standardised and therefore cannot be proofed. A proof without profile. Is that possible? Proofs are standardized products that are created and tested according to a certain set of values. This is exactly the point that distinguishes them from any “colourful printouts”. Specifically: A proof for coated printing paper is produced according to the standard values of ISOCoated V2 (paper type 1 and 2, glossy and matt coated image printing, dot gain curves A (CMY) and B (K) from ISO 12647-2:2004) and checked according to a set of values (FOGRA39L). A proof for uncoated paper (e.g. PSOUncoated or ISOUncoated) is produced and checked according to completely different value sets. Logically, because a print on uncoated paper looks definitely different in terms of colour and white value than a print on picture printing paper. A proof must therefore always be prepared according to a standard and be verifiable according to a reference value set. A list of the current Proof Profiles (as of 2012) can be found here. The problem: Many printing processes such as digital printing on a color laser or printing on a large format printing system (LFP) are not standardized and therefore there are no valid profiles and specifications. So what to do? The most frequently used standard has established itself as the “de facto basis”: ISOCoated V2. This is understandable, because colour-critical prints, catalogues etc. are mainly produced in offset printing on picture printing paper and are therefore subject to this standard. It is therefore generally assumed that a digital printer or an LFP printer, for example, should follow this standard and at least achieve this colour result. So if you need to make a proof but don’t have the exact details of the profile you need, proof ISOCoated V2, which has become the industry’s most widely used standard and will always be accepted as the basic proof. Unfortunately, a proof without a profile cannot be produced, because that would just be “colored paper from a proofing system”, but not a valid, ISO-compliant proof. Since 2009 PSOUncoated has been the standard profile for uncoated paper. Nevertheless, proof service providers often have the problem that at first glance proofs on PSOUncoated often differ significantly from the print result. Immediately visible: the white point of the paper. The PSOUncoated paper white looks very grayish. If, for example, PSOUncoated is proofed on an EFI 9120 XF paper, which actually has a neutral white coloration as paper, then the paper must be recolored by the printer in terms of paper white. This paper-white simulation makes the proof look “grayish” and often not “bright white” like the real production paper. “I can’t put this down to my client” proof service providers often hear from the agencies and designers who commission proofs. And frankly, printing on bright white uncoated paper will also differ significantly from the PSOUncoated Proof result depending on the paper selected. Some proofing services still proof uncoated paper according to ISOUncoated, because the paper tone is much whiter and not so grayish. In the medium term, however, this will not overcome the misery: PSOUncoated is the current standard according to which the process standard for offset printing certified print shops are also based. But in the pressroom the differences between norm and reality often become apparent. If the new D50 standard light according to ISO 3664:2009 with higher UV components is used for inspection at the printing table, then proof and printing result can often only be matched very poorly. And due to the long standardization periods, this problem will continue to accompany printers and proofing service providers for quite some time to come. What’s a proof for? The most important reasons for proofing! The proof shows the colour result of the subsequent printing. The customer knows exactly the later result from the proof and is reassured. The printer knows that the customer knows the proof and is also reassured. All professional service providers nowadays work with proof printers that are recalibrated at short intervals. A media wedge with test report also provides clear metrological proof that the proof is correct and within the limits of the standard deviations. In the past, repro studios often charged almost 30 euros for an A4 proof. Nowadays, it only costs a fraction. Proofing costs are of little importance in the production process. In most agencies, hardware-calibrated proof monitors are in short supply. And TFTs or old tubes show colors, but unfortunately some. A proof also depicts colors that standard monitors cannot display, but which can be printed. A proof simulates newspaper as well as coated paper. If the same advertisement is to appear in the glossy brochure for the trade fair stand, in the trade fair news and in the special supplement in the local daily newspaper for the trade fair, then the three different colour results can be excellently simulated and presented in proofs in advance. And who knows: Perhaps the customer will then have the house brochure printed on picture printing instead of on uncoated paper due to the proof, or will choose a different motif for the newspaper ad. The proof shows it. A proof can do CMYK and more! Modern proofing systems can reproduce up to 98% of all Pantone colours and HKS colours in the proof. This means that not only four-color, but also five, six and multicolor files can be proofed. Today, proofing is often done twice: once in CMYK plus corporate color in Pantone and once in CMYK and corporate color in CMYK. The client and agency can then decide whether the colour result is worth the extra charge for the fifth colour in the print. A proof is made of paper. Just like the product he’s simulating. A proof can be placed next to the print and compared under Normal. And to check it out, you can carry both to daylight, look at them in the candlelight and much more. A soft proof cannot do all this. This is the first incomplete list. You know of other good reasons? We look forward to any comments and would be happy to add further points. Softproof – opportunity or risk? 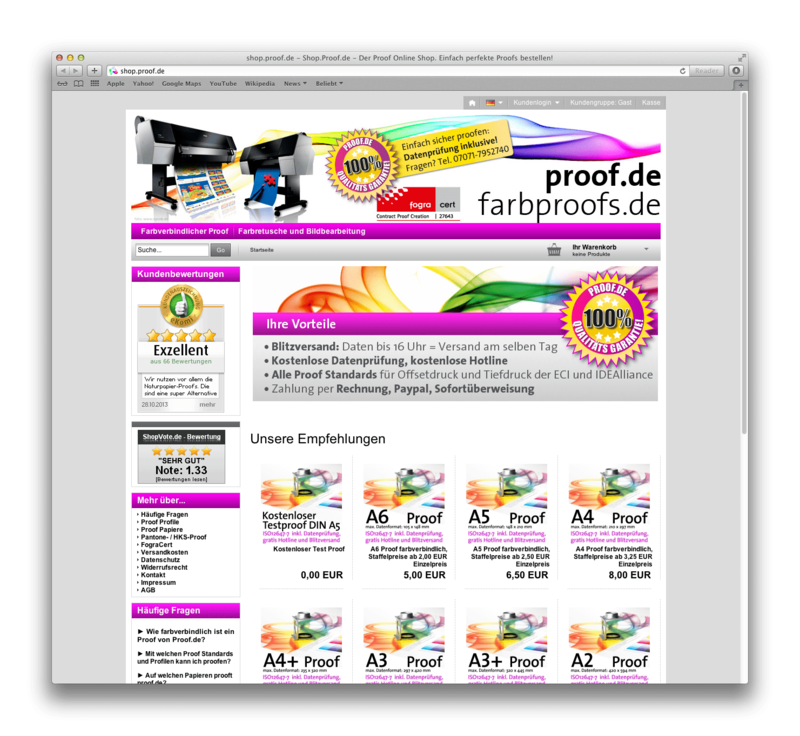 Softproof means: The correct color display of a printed product on a monitor. Both a standardized print, e.g. according to process standard offset printing, can be simulated – e.g. a later offset print according to ISOCoatedV2 can be simulated correctly in colour on the screen – and the output on digital terminals such as LFP systems in advertising technology. From a technical point of view, soft proofs are now well controllable. The monitor technology is advanced enough to provide excellent displays with a high color gamut and consistent illumination even for a few hundred euros. For example, monitors in two branches of a company can be coordinated in such a way that the result displayed on the monitors corresponds exactly to each other at both locations, i.e. one image editor in Hamburg and one in Munich can talk about retouching the same file. The problem: The fact that the two monitors emit the identical color and light result can be precisely controlled. The fact that the colleague in Hamburg is looking at the foggy Alster lake at a northern window, while the colleague in Munich moved the monitor to a southern window in the direction of the Isar river in sunshine, already shows the problem: The environment variables under which the softproof is viewed are not identical. Two scenarios therefore arise at the printing press: Either the printer is “in the light” and can then match the print with a contract proof printed on paper, or it is “in the dark” and can match the print with the soft proof. The difficulty of matching paper and monitor – and these are two completely different and difficult to compare media – is compounded by the difficulty of the printer having to dim the light at the press by up to a factor of 10 to be able to match both a contract proof and a soft proof at the same workstation. From today’s point of view, this does not really seem practicable. Conclusion: The soft proof is on the advance and will certainly sooner or later displace the classic contract proof from the market for reasons of speed and cost. However, due to the great technical lighting and haptic differences between the monitor and the illuminated sheet of paper, a widespread introduction is still a long way off. After all, anyone who has ever performed a color match on a printing press can imagine that a match to the contract proof on the one hand and to a soft proof monitor on the other hand is difficult to imagine at the same time. The contract proof will therefore also have to remain the first choice in the near future in order to be able to carry out colour-accurate proofing of the printing result in the pressroom. Embed profiles for proofing? Yes or No? The question often arises whether color profiles should be embedded in the PDF files for proofing. To answer the question, you have to get some answers: The proof should simulate the subsequent offset printing. For offset printing, with few exceptions, the imagesetters have been configured so that a 70% black in the file is displayed as 70% black on the printing plate, no matter what profile was specified in the file. It didn’t matter whether it was coated paper or uncoated paper: 70% in the file corresponded to 70% on the plate, the choice of the paper printed on resulted in the colour representation. The proof has also adapted to this: Most proofing service providers ignore embedded profiles, as long as the data is in CMYK and do the same as their print colleagues. Even with grayscale, the profiles are usually ignored and the grayscale is simply assigned to the CMYK black channel. Thus all CMYK and grayscale data are simply interpreted as if they had been created in the output color space. If “ISOCoated V2” is proofed, all images are treated as such, and if “PSOUncoated” is proofed, then the CMYK images are created in this color space. This is excellent for the majority of files to be proofed. Only RGB colors contained in the data are problematic. Since the RGB color space is considerably larger than most CMYK color spaces, it must be clear from which color space to convert to CMYK according to which criteria. Most proofing service providers specify a color space from which they convert by default if no RGB color space is defined. This can lead to difficulties: For example, many proof studios choose AdobeRGB as color space because it is large and optimized for offset printing; however, most images from digital cameras come from sRGB and these color spaces differ considerably. Therefore, it is important that the RGB color space and the rendering intend is embedded for a proof, otherwise the proofing software normally selects a color space for conversion to the CMYK color space to be proofed; and this color space is possibly not the one in which the data has be created. Depending on the selected setting, the GTIN lines in proofs are displayed smoother or less smooth. It is clearly visible that the modules are made up of many colours and that a considerable increase in width takes place especially within the narrow black lines. Normally a narrow black GTIN bar should correspond to the width of the white space. Proofing service providers are increasingly required to be able to display “verifiable” GTIN codes, i.e. barcodes in the proof. The background to this is that especially the big german discounters like Aldi, Lidl, Hofer & Co. want to see a packaging proof from their suppliers in advance for approval. This packaging proof is not only visually assessed according to colour, but also the legibility of the printed EAN codes is evaluated using a measuring device and must meet certain criteria: Symbol contrast, modulation, decodability, defects, blemish: all this is measured and graded. This involves two different risks for the advertising agency or the reproduction company that processes this data: Firstly – according to our information – in most cases the proofs are not viewed under D50 standard light, but under TL84 – the light under which the packaging will also be seen in the later sales situation. This is understandable, since the sales process takes place under TL84 and not under the standard light of a printer. On the other hand, retouching under TL84 is not mandatory, since the spectral behavior of “standard” neon means that it is not possible to produce such a reproducible and “color-accurate” result as under D50. In addition, a colour matching box with D50 and TL84 is available in very few companies, which makes it possible to view the result under both light conditions in the colour retouching. Secondly, the proofed GTIN barcodes are measured by a measuring device and checked for their mechanical legibility. Whereas a few years ago a press proof was the standard for such tests, today mostly the digital proof is used, since it is much cheaper. But until now, the manufacturers of proofing software have always only paid attention to the representation of color, but never to the verifiability of black and white lines. 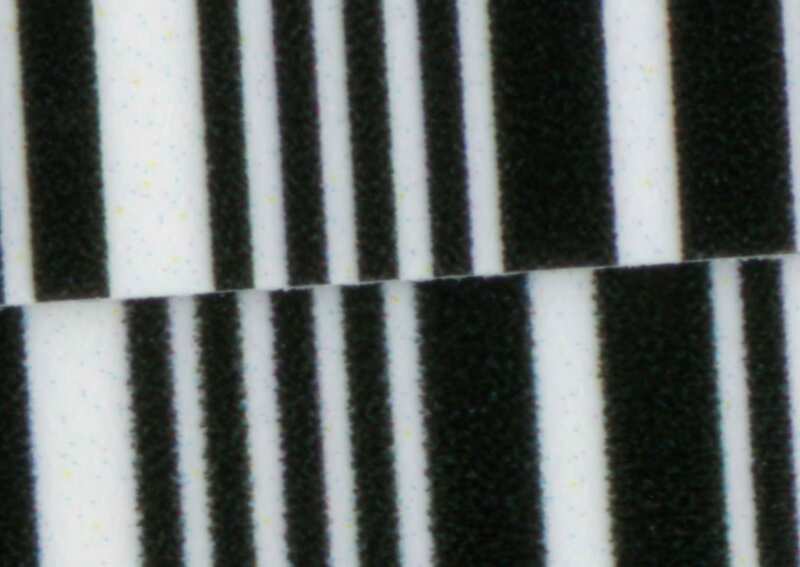 Especially with Fiery proofs, but also with GMG Color, the lines of the GTIN barcodes are usually reproduced in such a way that they correspond exactly to the black value of the required profile in terms of color, but only school grades of 3 or even 4 are achieved during the examination, depending on the discipline. Most scanner cash registers could still read and process these barcodes without problems. However, ALDI Süd or Hofer with their own GTIN codes require at least a second grade in all disciplines: The proofs all fall through the test grid of the discounters. In particular, the decodability of EAN codes has probably not been of particular importance to proof manufacturers up to now. After detailed tests, the width increases of the GTIN bars in the digital proof and the blurring of these bars seem to be the biggest problem for the verifiability of the codes. 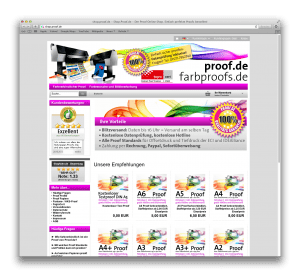 Farbproofs.de has developed a solution together with one of the testing companies for barcodes that makes it possible to print testable GTIN codes in accordance with the strict ALDI standards, which also comply with the current proofing standards. A proof is therefore sufficient for colour matching and for checking the GTIN numbers. However, the EAN must be created and edited specifically for this purpose. This still costs far less than a conventional proof, but it is not satisfactory. Manufacturers of proofing software such as EFI and GMG Color are therefore called upon to improve the calculation of black and white line representations in writing and GTIN codes. Until now, the focus has always been on color accuracy, but the proof increasingly demands services that were previously reserved for proofing. At costs of 5-10 EURO for a digital proof in DIN A4 format and 150-300 EURO for a proof in the same format this is more than understandable. An article with tips for the creation of EAN / GTIN codes for graphic designers and the problems of verifiability of EAN and GTIN codes for e.g. Aldi, Hofer, Lidl and Co can be found here. What data should I give for proofing? A proof is suitable for two types of color control: firstly, during the creation or retouching phase, e.g. to reconcile a color retouched image with the original, and secondly to check the final data directly before printing. For control proofs during the data creation of a project, the data format usually does not matter. Whether PDF, JPEG, TIFF; EPS, PS or even PSD… Many proofing companies accept a variety of data formats. For a correct evaluation of the result, however, it is important to proof in the color space in which the print product is also created later. Data for a letterhead should therefore be proofed in ISOUncoated or PSOUncoated, while products printed on image printing paper should be proofed in ISOCoatedV2. For yellowish paper, newsprint or gravure printing, there are many other profiles for which a proof can be produced. You can find a good overview of the current proof profiles here. It is also important that the proof format and the final print format do not differ too much. Only in this way is a correct check possible. When the brochure has been laid out or the catalogue production has been completed, a proof should be prepared again for the final check by the customer. This proof is then created with exactly the same data that is also sent to the print shop. This is usually a PDF X/3:2002 file, as this is the preferred data format for printers. If the pages are delivered to the printer with bleed marks and bleed, then the proofs should actually be created in exactly the same way. The finished proofs can then first be used as approval for the customer, and secondly for checking the OK sheet in the print shop. This ensures that no unpleasant surprises wait for the customer (what does the colour look like????) or the printer (why does the customer make a complaint?????) after printing and bookbinding. Can spot colours be proofed? Since many printed matter contains spot colours such as Pantone or HKS, the question often arises whether these colours can be proofed at all. The answer is “no”. Only an approximate simulation of these colors is possible. The reason: Each special ink is a specially mixed, “real” ink and therefore cannot be mixed from the 4 printing inks (cyan, magenta, yellow and black). Today, modern proofing machines have up to 12 different printing colours and, in addition to the classic primary colours, also have, for example, orange and green and violet as real colour pigments in the machine. Proof printers such as the Epson SureColor P9000V are therefore capable of displaying significantly larger color spaces than, for example, ISOCoatedV2. The spot color simulation in these devices is therefore sometimes very good when controlled via a Contone driver, which can access the entire color space of the proof printer. Epson himself points out, for example, that “98% of all Pantone colors” can be covered. This may be doubted, but a number of over 90% of all Pantone colors is realistic from our point of view. In the past, Pantone and HKS colors were simply converted by the proofing systems to CMYK and then simulated in the standard color space, i.e. mostly ISOCoatedV2. The representation of the colors here is mostly completely insufficient. For the reproduction of Pantone and HKS colours in a proof it is therefore immensely important to have a modern proof printer with many colours and a high colour gamut and a modern proofing software which is also able to precisely control the printed gamut. Differences in the quality of the simulation of spot colors can quickly be seen in the different printing systems: If the proofing service provider prints with an older 6-color or 8-color system (Cyan, Light Cyan, Magenta, Light Magenta, Yellow and Black or Light Black), spot colors are simulated worse than, for example, with a modern 11-color system with Cyan, Light Cyan, Orange, Yellow, Magenta, Light Magenta, Photo Black, Matte Black, Light Black, Light light Black and Green. The higher simulation quality of the spot colors is generated by the fact that orange, for example, already exists as a separate color and does not have to be mixed from magenta and yellow before the spot color simulation. Of course, it must be said that there are limits, especially in the area of metallic or fluorescent colours; these colours are currently not reproducible in proofing. In most proofing systems, only the 100% values of a Pantone or HKS color are underlaid. If, for example, a font logo with 100% color application of a Pantone color is to be simulated, this is precise and is well represented in most proofing systems. However, it becomes more difficult if the logo contains not only 100% areas but also a 30% Pantone colour area, since this is not defined in the proofing system, but is simulated by the proofing system. In some cases, considerable deviations from e.g. HKS colour fans can be observed. It becomes even more difficult if, for example, a grayscale TIFF lies on a 100% HKS area and overprints. For the graphic professional it is immediately comprehensible that the HKS surface simply has to become correspondingly darker at this point due to an overprinting 30% black. However, the proofing software must recognize this effect correctly, calculate it correctly and then simulate it correctly with the 11 colors available from the proof printer. It is easy to understand that countless errors can occur. And the supreme discipline: 7-colour Pantone files with lots of overlaying and overprinting Pantone colours or HKS colours with overprinting CMYK elements can at best be calculated even by the most modern proofing systems, but can by no means be colour-accurately simulated. The bad news is that a proof with spot colors is therefore never as color-binding according to the current state of the art and varies more depending on the proofing system. But the good news is that spot colors, especially solid colors, can now be simulated well by modern proofing systems. A modern proofing system therefore also offers the possibility of getting a realistic impression of spot color prints at a fraction of the cost of a test print on a offset press. Embed fonts, convert them into paths or rasterize them? To ensure secure data exchange between customers and proofing service providers, fonts must be embedded, converted into paths or rasterized. This ensures that it is and remains exactly the same font and exactly the same style. With InDesign and QuarkXPress, you select the PDF/X-3 standard when exporting data. For Illustrator and Freehand, select the font and select “Convert font to paths” from the menu. In Photoshop, select the text layer, right-click on it and select “Rasterize Text”. What is the UGRA-Fogra Media Wedge 3.0 used for? Every print shop in Germany adheres to a predefined standard, the process standard offset printing. This standard defines target and tolerance values for printed products. In order to prove that your proof delivered to the print shop meets these standards or is within the tolerances, the media wedge is measured and the values analysed in case of doubt – i.e. in case of a streak. If these measured values are correct, the print shop is obliged to adhere to and achieve these values. Practice generally shows the following: If you want to have a 4-page image brochure proofed and printed, it is usually sufficient to have a single media wedge printed under the 4 pages. If the media wedge is also provided with a test report, the colour accuracy for the print shop is directly confirmed as a guideline. However, if you want to be on the safe side, have a separate media wedge (including test report) printed under each of the 4 pages of your brochure. What is a Contract Proof? Softproof? Validation Print? Very simple: A proof is the simulation of a later print, either as soft proof on the monitor or as contract proof, validation print or as form proof on paper. Softproof: A softproof is the color-accurate representation of the print on a monitor. This can be done either at the agency or directly at the printing machine, for example, so that the printer can coordinate the production run with the soft proof. Contract Proof: The “highest” level of proofing: A contract proof is a very high-quality simulation of the subsequent printing result, and is nowadays actually always produced with special inkjet printers on special paper with special software. The UGRA/Fogra media wedge print makes the proof “colour and legally binding”. In the best case, the media wedge is checked directly during proof production with a measuring device and a test report is glued or printed on which confirms compliance with the tolerances. Validation Print: A Validation Print has higher tolerances regarding the color deviations from the given standard than a contract proof. It is therefore not “colour and legally binding”, i.e. it does not serve as a contract or “contract” between the designer and the printer, unless both parties have agreed that Validation Print can serve as a colour reference. Validation prints are often used in the coordination process in agencies or as quick templates with good colour matching, as they can also be produced on current laser and LED or other digital printers. Compared to inkjet printing, these printing systems are many times faster and cheaper. Form Proof: A form proof is often found in print shops; large sheets of paper on which the finished imposed sheets, e.g. of a magazine, are printed. Form proofs are printed with inexpensive inkjet plotters on inexpensive paper and usually look terribly coarse and pixelated, even the colors are terrible. However, the data for the form proof runs through the same workflow with which the printing plates are later produced. This means that what can be seen on the form proof can later also be seen on the printing plate. Thus, the final printing forms can be optimally checked once again to ensure that all fonts, images and embedded graphics are displayed correctly. However, a form proof is by no means binding in terms of colour.